The South Sudanese Community Lutheran Church meets at Zion Lutheran Church in Denison, Iowa, on Sunday afternoons. In small, rural, diverse towns like this one, religious institutions can play an important role. Often, they provide needed social services. Many are a small slice of home. And they can serve as some of the most prominent points of connection between the different communities in town. Recently on a hot Sunday, parishioners at the English language mass at St. Rose of Lima exited the Catholic church to the sound of a live band and the smell of tacos and papusas outside. Denison is the seat of Crawford County, where more than a quarter of the people are Latino. Father Paul Kelly enjoys ministering to both the Spanish and English speaking parishioners at separate Sunday masses. 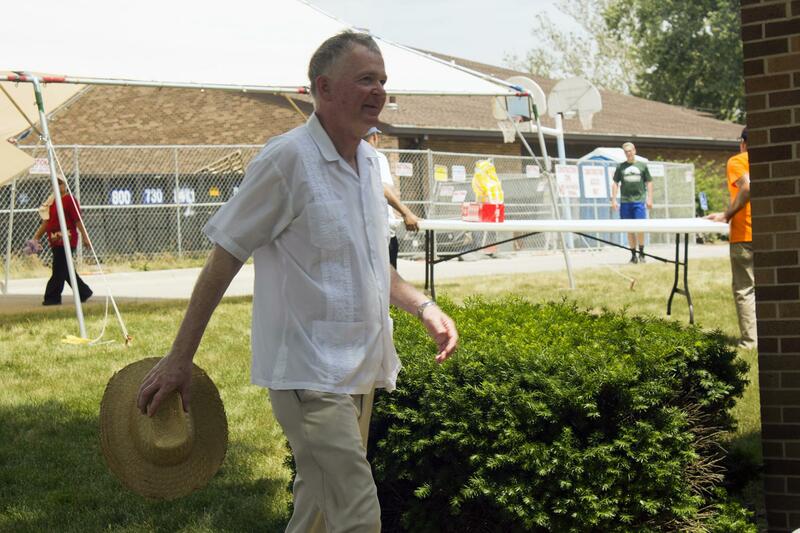 After celebrating Mass in English and then in Spanish, Father Paul Kelly changed into light-colored clothing to enjoy a festival of Latin music and food on a hot Sunday. As people buy lunch to raise money for a church construction project, Kelly says he often sees a mix of both congregations at festivals and fundraisers like this one. The money raised will be used for the new education wing, which will benefit everyone. Maria Soledad Laura Rodriguez came to Denison 10 years ago from Guanajuato, Mexico. Fifteen years ago, Denison had a brief, tragic moment in the national spotlight. Eleven Latino people looking for jobs in the city’s large meatpacking plant boarded a train car full of hope but lacking legal working papers. They were locked in, and never let out. A railroad worker found their bodies when the car was opened for cleaning. Today, the Latino community is well-entrenched, with many small business owners, a Spanish-language newspaper, and Latino officers on the police force. Despite the deaths in the train car, many people still make their way here from Latin America. They’re fleeing poverty, gang violence or persecution, as generations of immigrants have done throughout history and around the world. These arrivals from Mexico and Central America land here alongside refugees from Africa and Asia. In particular in Denison, they often come from South Sudan and Burma (now known as Myanmar). The long, hard hours of meatpacking work attract newcomers because it doesn’t require much English and brings in a steady paycheck. 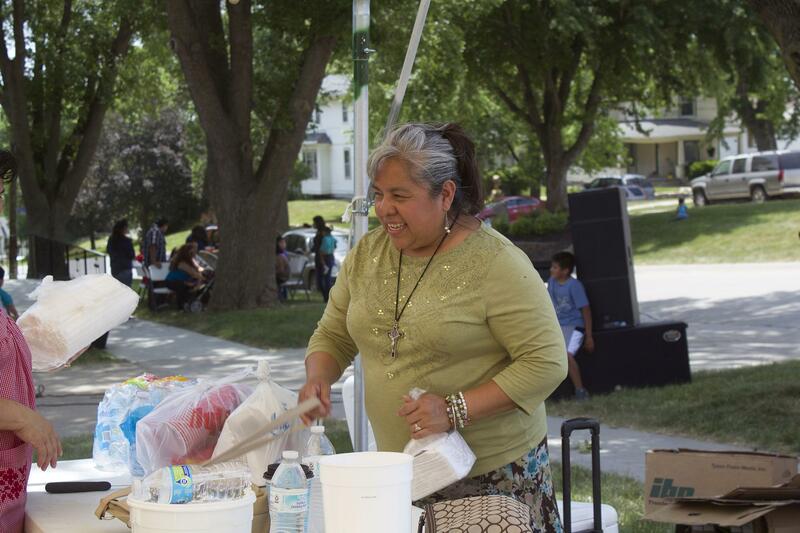 Maria Soledad Laura Rodriguez helps clean up after selling bottled water during a church fundraiser at St. Rose of Lima. Churches in places like Denison have a tricky role. They want to help the town accept its changing identity, while also offering a place where people feel comfortable, including the people who have called Denison home for generations. Churches can be a place where different communities come together. But maintaining one’s identity, rather than shedding it to fit in, is also important. Working through that struggle, 21st century immigrants in Denison are just like every other wave of new arrivals to this country. Pastor Marc Wallace is trying to offer something different. In 2009, he came to Denison to accept the challenge of reviving a dying Baptist church. He doesn’t want language to segregate his church community and has technology that allows an interpreter to offer simultaneous translation when requested. (He learned Spanish serving as a missionary in Venezuela, but church members also speak several other languages.) The services are in English, but he works hard to attract members of all of Denison’s different ethnic groups. 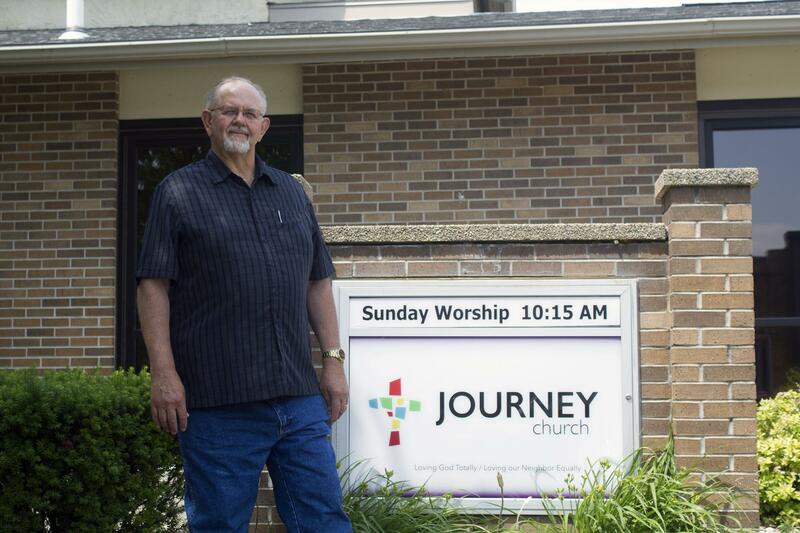 Wallace worked with a handful of church members and together they committed to creating a multilingual and multiethnic congregation, which they renamed Journey Church. It’s still small, but is a place where longtime residents of Denison and its surrounding rural areas are worshipping alongside immigrants. Wallace also started working with city officials to help bring different groups together and he’s brought some of his congregants to tell their refugee stories to community groups like the local Kiwanis chapter. He says he sees a lot of fear among people who don’t know each other. Marc Wallace came to Denison to reinvigorate a dying church and is trying to grow a multicultural congregation at Journey Church. Wallace also wants to help immigrants with education or specific skills find jobs outside the meatpacking plant. He says a man who trained as a veterinarian in South Sudan was working at the slaughterhouse, for example. Wallace helped connect him with a retiring veterinarian in town and eventually the man got a job in the animal clinic. Just as the Mexicans at the Spanish mass at St. Rose of Lima hear the call to worship in their native tongue, some of Denison’s Dinka, from South Sudan, worship in their language. 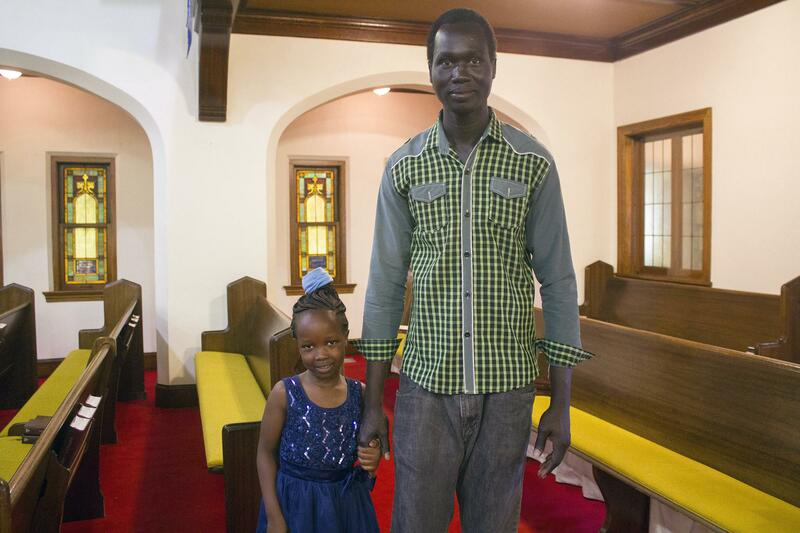 They formed the South Sudanese Lutheran Community Church and rent space at Zion Lutheran Church in town, which is also home to both an English-language congregation and a Spanish-speaking one. On the same hot June day as St. Rose’s fundraiser, men wearing suits and shiny shoes, or bright patterned African shirts, gather for a service of almost entirely Dinka. Toddlers race about the sanctuary while other children sit in pews with their families. Dinka-language hymnals provide the lyrics while a group plays traditional drums to accompany the singing. Abraham Kamich and his niece Achol Ajak attend a church service in Dinka, the language of their South Sudanese tribe. Abraham Kamich left South Sudan and studied agriculture at a high school in Kenya. He has lived in Seattle and worked on fishing boats in Alaska. He chose to stay in Denison and work at the meatpacking plant. And whenever possible, he attends church services in Dinka. Whether in a small rural town or a giant American city, the desire for comfort and familiarity splits many people along linguistic or cultural lines when it comes time for Sunday worship, even in churches committed to embracing the changing communities they serve.